You can now make your surveys match the look and feel of your brand. With SurveySparrow branding feature, you can choose the primary and secondary colors that compliment your brand. 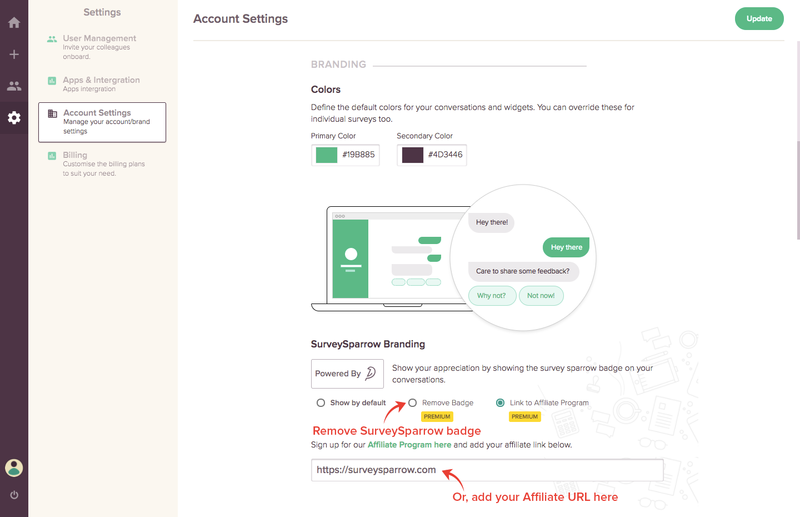 If you are a premium plan customer, you can also remove SurveySparrow branding from your surveys. If you also want to earn from the survey, you can choose to be our affiliate and replace the SurveySparrow badge with your Affiliate URL. This might even earn you more than what you paid for the premium account :). If you wish to be our affiliate and earn from your surveys, insert your affiliate link instead.